The 22-story Pembroke at Fort Lee, located at 2077 Center Avenue, consists of 192 one- and two-bedroom cooperative apartments, all but 19 with balconies. The property features both indoor and outdoor on-site parking, newly refurbished front exterior with landscaping and a stunning lobby sure to impress you and your visitors. Other improvements recently undertaken include a complete modernization of the terrace railings and parking deck, reconstruction of the swimming pool deck, and installation of a comprehensive electronic surveillance and security system. each story consists of 10 apartments with unique floor plans. Every unit except the "E" line features a terrace. Our responsive maintenance staff, with an average tenure of 20 years, is supervised by a resident superintendent, not only tending to cleaning and maintaining our common spaces, but also available to handle routine repairs to our property. In addition, our professional building manager maintains an office on site. Our 24-hour, 7-day a week doorman security is enhanced by several electronic systems to provide our residents with a high level of security. 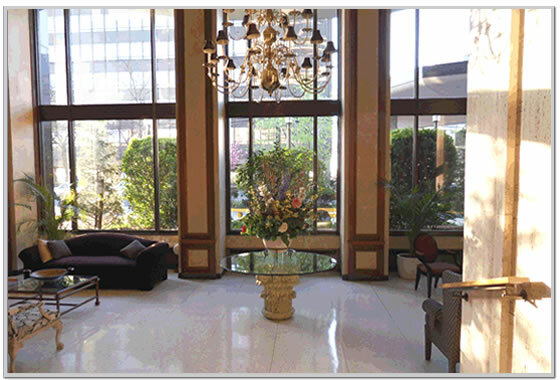 We feature closed-circuit TV cameras, two-way intercom to each apartment, and require all visitors to be announced. Apartment doors can be individually alarmed to detect unauthorized entry when no one is home. Additionally, all entry ways and automobile entries are secured with state-of-the-art electronic access and video surveillance. Off-street parking is available to our residents and guests in our outdoor refurbished garage deck and indoor garage. The indoor garage is accessed only with an authorized access device, and it features a newly-installed sprinkler system. Domestic pets, including dogs up to 25 lbs. may be kept by residents. An application fee must be paid, along with a monthly maintenance supplement. Video surveillance is provided to our laundry facility which features prepaid card-operated washing machines, gas dryers, laundry carts and laundry folding tables. Heat, air conditioning, ventilation, cooking gas and water are centrally provided and covered in the monthly maintenance fee. We offer residents free storage for children’s and adult bicycles inside our secure storage area. Secured bin storage is offered for a fee on a first-come, first serve basis. From Memorial Day through Labor Day (and often beyond), Pembroke residents and their guests avail themselves of the newly-refurbished and landscaped outdoor adult and children’s swimming pools, with onsite certified life guard provided. Poolside barbeques on the pool deck have become a tradition. By virtue of our collective buying power, Pembroke residents have access to a discounted cable TV and premium channels package with enhanced DVR, all included in the monthly co-op billing. Optional broadband Internet access is available at reduced rates. Wi-Fi coverage is provided in public spaces like the Health Club, the community meeting room and pool deck. Our concierge staff will gladly help you unload groceries from your car into carts you may borrow, and sign for your parcels and packages so you don’t have to rush home. They will also gladly accept your dry cleaning deliveries before you return from work.